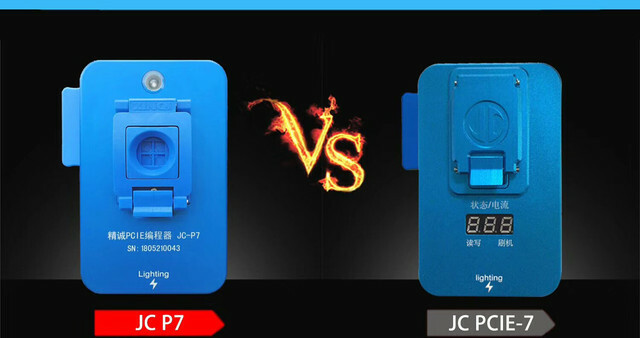 Usually we compared the two item which is with the similar function , But always they from the different manufacturers, Today, we will find the difference from the same factory item, JC P7 PCIE Programmer and JC PCIE Nand Testing Fixure. Many technicians says, it is appearance almost the same, even you checked with all the functions, but it is hard to find the difference of them. How to find their similarities and differences, in order to better identify and use them. 1. All two support SYSCFG Partition perfectly Read/Write Compatible with all capacity nand ic from original manufacturers. 3. All two not only work with PC, But also can work with JC PRO1000S. 4. All two Support lifetime software upgrade for free. 4. JC P7 PCIE Programmer Support completely clean all SYSCFG data to solve itunes reporting errors caused by SYSCFG data errors. But JC PCIE Nand Testing Fixure only support partically clean SYSCFG data. 5. JC P7 PCIE Programmer Read/write SYSCFG only in 1 second, But JC PCIE Nand Testing Fixure takes 8 seconds to read write SYSCFG. So far, we will list so many similarities and differences. Over time, perhaps both products will be upgraded and improved. At that time, nandrepair will summarize more product information points. Thank you for your attention.